A Belgian company is working on removing the raw materials from dumps, making both energy and building materials out of them, and then redeveloping the land. About 50 miles east of Brussels, next to an old coal mine, lies a festering stinkhole that few people ever visit, and most people would rather forget about. Dating from the 1960s, the Remo Milieubeheer landfill at Houthalen-Hechteren is a typical dump full of industrial waste and household garbage–16.5 million tons of it in all. Hardly the sort of the place to get anyone excited. Except, that is, Patrick Laevers, director of Group Machiels, the Belgian waste management company that owns the site. Laevers has a 20-year plan to excavate the entire expanse, recycling about 45% of its contents, and converting the rest into electricity. Eventually, after a complex, multi-phase process he calls “Closing the Circle,” he hopes to turn the site back to nature. What’s more, Laevers thinks Houthalen-Hechteren could be the first of many such projects around the world. “We really believe this concept is the future, and that we can all benefit from it,” he says. Group Machiels first began researching the idea of landfill mining back in 2006, in cooperation with three academic partners. Since then, it has collected 2,000-3,000 tons of material for testing, assessing each area of site for recycling and energy-generation value. Laevers says Machiels had fairly detailed records of what had been dumped where over the years. But it needed to find out how much different materials had decomposed over that time. Machiels has formed a joint venture with Advanced Plasma Power, a U.K. energy-to-waste company that converts the non-recyclable residue into a mixture of clean-burning natural gas–which generates electricity for 100,000 homes–and a building material called Plasmarok. Machiels hopes the scheme, which has cost hundreds of millions of dollars, will be fully operational in 2014. Unusually, Laevers has published some of the project data and know-how in papers and at conferences, hoping others will follow in his lead. He says he has been contacted by people from Chile, Belgium, Bulgaria, Hungary, and Romania, all wanting to find out how they might adapt the project for their own landfllls. “Everywhere in the world, people are starting to realize the potential from mining landfills,” he says. Rolf Stein, CEO of Advanced Plasma Power, says “the mind boggles at the potential” for landfill mining–and not just for energy and recycling. Several companies with landfill sites near cities are looking to reclaim land for property development, he says. There are few reliable statistics on the worldwide volume of landfills, though it’s easy to get a sense of the magnitude: The OECD says 3 billion tons of trash a year will be hitting landfills worldwide by 2030, up from 1.6 billion in 2005. 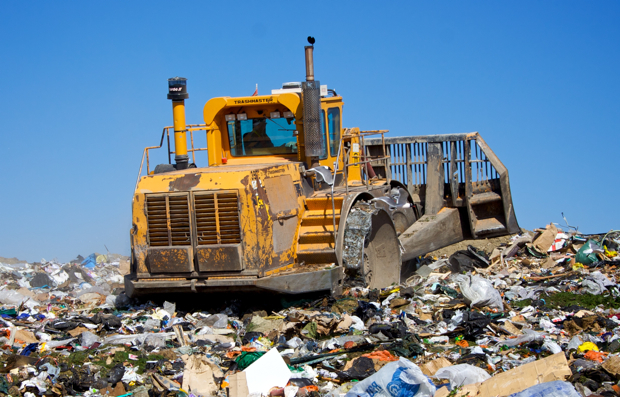 The concept of mining landfills has been around for years. In the 1950s, the Israelis took soil enriched with waste and spread it over orchards to improve earth quality of the land. And, in the 1980s, some U.S. states farmed landfill material for use in incinerators. But it has taken rising energy prices and higher demand for recyclables (notably plastic and metals), to make landfill mining viable for companies like Machiels. That, and government support: A key part of the funding for the Houthalen-Hechteren project is coming from renewable energy credits.